Want to make photographs with a smartphone and nothing else? Go ahead, shoot without shame. Want to use a 100+ year old Box Brownie as your camera of choice? Maybe you prefer a classic 70’s SLR like a Spotmatic or OM? Is your favourite light tight box an 80’s Autofocus plastic wonder like a Canon Sure Shot or Minolta AF-S? Rather slow things down with a homemade pinhole camera and exposures that last up to 60 minutes? Enjoy nothing better than the feel of a Leica rangefinder and lens between your fingers? Get thrilled with Lomography classic like a Holga 120N or Superheadz wide angle? Love your up to the minute Sony or Fuji mirrorless like no other? The message is clear. Whatever you enjoy shooting, make the enjoyment of using it your priority. Forget about formats, brands, resolution, pixel peeping and every other kind of variable where you’re constantly comparing what and how you shoot with everyone else. Make photographs for yourself and no-one else, with the kit that makes your heart (and eyes and mind) sing. Stand up and be proud of using whichever camera you love most. Life’s too short for anything else. Which camera will you use next to shoot without shame? Thanks! What are you enjoying shooting with currently? I agree with your outlook/philosophy and last night I was shooting with a Pentax Q-S1 and a Ricoh XR-P multi-program film camera. Thanks Chris. What do you like about each of those cameras? Oh and which lenses? Sometimes these things just have to be said Jim! The Pentax Q-S1 had the 02 Standard Zoom 5-15mm and other 42mm mount lenses as I have an adapter to use them on the Q. I like the Q for its compactness and versatility. The XR-P I had the Rikenon P 50mm f1.7 on it with Fomapan 400 in it and I am just trying it out for the first time but my first impressions are good, it feels nice in the hands. Chris, what are your thoughts on the 02 zoom? I’ve resisted getting one for my Q, the main reason being it might well make my two Ricoh compacts redundant and I really like them! 28-80mm on a full frame/35mm have a look at my recent images on Flickr and judge for yourself. 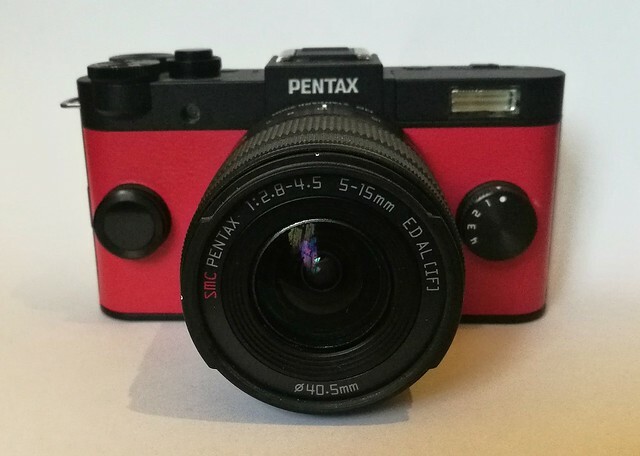 I think I may have to get one… Wide at 28mm (on my original Q) it’s likely to be more than good enough a rival to my Ricohs, the only concern is close focus as they go down to an amazing 0.01m. I like the red leather on your Q by the way! Is that an aftermarket covering or did it come like that? I couldn’t agree more. These days I’m using a 1945 Leica IIIc converted to IIIf BD specification by Don Goldberg with a 1958 50/2.8 Elmar lens. It’s small (which I like), heavy (which I like) and just feels right. That’s what it’s all about Doug, just using what feels right. Intriguing, what’s a Taron Robin? I googled it but no matches! Sounds an ideal match! Is this new to you, or a camera you’ve had a while? Ooh what was the other acquisition? Sounds like your loving the Voigtländers! Did you ever had a Vito B? I had a couple, very pretty little things, and impressive lens. What a silly comment. Well done for not responding. I pity him for not knowing the joys of photography as we do! Thank you Tim! What’s your favourite currently? Interesting. Perhaps something in the ether lately: on another site just now, a shooter working with an undistinguished zoom P&S has it that his only rule is to “…shoot anything that works.” Even at that, he does not much drill-down into most of its more sophisticated functions. A refreshing, simpler, less-“thoughty” approach. Maybe this signals a bit of anti-marketing backlash against the relentless flogging, FOMO-ballyhooing in the update cycles of photo gear. I think it’s also connected with the general backlash against social media we’re seeing. People just want to get back to simpler, more fulfilling experiences without the unfortunate layers of surface noise and redundancy that technology seems to (try to) drown us in. Lately I’m coming around to the fact that I should stop worrying and do as you say… Shoot without shame. Don’t give a damy about opinions, gear sites and pixel peepers. Don’t listen to so called purists, of the rangefinder, SLR, film or digital confession. And above all don’t fall for the advertising stuff! You said it all in your post! I think it’s the way forward Frank. I realise in some ways I fell for almost the opposite to the advertising hype in the past, wanting to make great images with deliberately low end and/or cheap equipment to prove you don’t need to spend £100s (even £10 sometimes!) on a camera to have a rewarding shooting experience and satisfying results. Like my recent rediscovery of my old 5MP Sony Elm cameraphone. Even my amazing Ricoh GRD III and Pentax Q cost under £150 each. What can you get new for that these days?